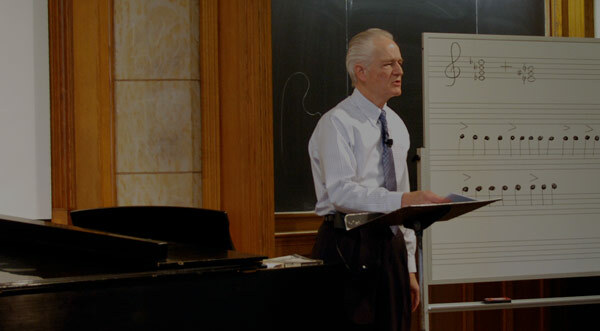 In this final formal lecture of the course, Professor Wright discusses Modernism, focusing on Stravinsky’s The Rite of Spring. He explores several musical reasons why The Rite of Spring caused a riot at its 1913 Paris premiere. Professor Wright then goes on to share with the class one of his favorite pieces, by Gustav Mahler, the orchestral Lied “Ich bin der Welt abhanden gekommen.” After an enumeration of this piece’s qualities, Professor Wright ends the class with a paean to classical music and an exhortation to all to preserve this great tradition. Creating the Dissonance and Irregularities in "The Rite of Spring"
Professor Craig Wright: So today we’re going to engage Modernism. We’re going to be talking principally about the music of Igor Stravinsky. I should also mention Arnold Schoenberg. Just as Verdi and Wagner were the principal composers of opera in the nineteenth century, so Schoenberg and Stravinsky were the principal proponents — not only of instrumental music, but some vocal music — in the first half of the twentieth century. So we want to keep them carefully positioned on our radar screen here. Igor Stravinsky, of course, was a Russian composer, born in St. Petersburg. You have the dates up there on the board, I’m sure. He studied with Nikolai Rimsky-Korsakov, who wrote one famous piece, Scheherazade — which I used to hear all the time as a kid — and then caught the eye of Sergei Diaghilev. Serge Diaghilev was an impresario. What’s an impresario? Who can tell me what an impresario is? It’s a fancy word for — Thaddeus. Professor Craig Wright: A producer. Okay. Think of the Broadway show “The Producers.” He’s simply a producer. And what Diaghilev was producing and importing into Paris from Russia was Modernist art from Russia — Modernist painting, Modernist ballet, Modernist art music, and Modernist opera. So that’s what we want to keep in mind with regard to Sergei Diaghilev. And for Diaghilev, Stravinsky composed, early in his career, three important ballet scores, and you have those titles up on the board there: Firebird with its date — what? 1909 — Petrushka, 1911, and then The Rite of Spring in 1913. Now, the first of these ballets to really show a heavy Modernist content is not so much Firebird but more the second of this troika here, Petrushka. It’s modern because of the new approach to rhythm. In the Romantic music that we have been listening to, we would hear these long, somewhat amorphous melodies, amorphous in terms of the rhythm. But now here with the advent of Modernism in the twentieth century we get a much more driving type of rhythm. It almost in some ways goes back to the driving rhythms of the Baroque except with one major difference, and that is that these modern rhythms are highly irregular. What we get oftentimes are irregular meters. What would you imagine an irregular meter is? Anyone want to field that one, irregular meters? Well, simply said, it’s not a succession of two-four, two-four, two-four, two-four or three-four, three-four, but two-four, five-four, four-four, two-four, six-four, three-eight, and so on. Each measure can have a different meter. In addition, we also have this phenomenon called polymeters in which you could assign to your clarinet to play in three- four and your bassoon to play in four-four, and maybe your violins in seven-eight. So as a result, you get something of a disjunctive, rhythmic texture here, disjointed rhythms. And the second aspect of this approach to Modernism has something to do with the orchestration. There’s a great deal more emphasis now on percussive effects. New instruments are added to the orchestra, instruments called the xylophone, the glockenspiel, the celesta. And if you want to see a picture of some of these you could open your textbook at some point — just write this in your notes — see figure — I think I wrote it down here — figure ten — no, excuse me — five, number ten, chapter five, number ten. You can see some of these percussion instruments, but basically they’re just either sticks or pieces of metal bars that you beat with sticks, or, in the case of the celesta, you activate with a keyboard. So we’ve got these two things here: driving but irregular rhythms and we also have this new approach to orchestration. So let’s listen to a bit now of Igor Stravinsky’s ballet of 1911, Petrushka. [music playing] Can you conduct this? [music playing] Jacob and I were fooling around with this in the background, trying to figure out what these meters were, see if we could pick up these different changes, but they are as — and how’d we do? Not well. Jacob says we did not do well. Because without the score, it’s difficult to anticipate which meter is going to come next. And you heard the intense percussive effects there. But Stravinsky’s most radical statement of Modernism occurs not here in “Petrushka” but two years later in The Rite of Spring. It premiered in Paris in May of 1913, and it’s become something of a cultural icon, this whole idea of the Rite of Spring. Indeed I have this book, and I’ve had it for quite a while, Rites of Spring by Modris Eksteins. It’s often required reading in the history department here, history program. Has anybody ever run into this, been asked to read anything by Modris Eksteins? Well, the subtitle is here: The Great War and the Birth of the Modern Age, but it’s not accidental that he is playing off of this title of a ballet of Igor Stravinsky, because the ballet of Stravinsky was a kind of watershed, a touchstone, the benchmark from which Modernism can be calculated and against which it can be measured. So when the audience arrived there at the Theatre Champs-Elysees in Paris — and that theatre still is there. You can walk down the Avenue Montagne — it’s where Hermes is and Gucci and all of these fancy stores; it’s there in Paris — and go in and still hear concerts there. I’ve heard concerts in the Theatre Champs-Elysees so you can still do that today. It’s still functioning. It’s one of the major concert halls in Paris. So, in any event, May 1913, the audience arrives. They are there to hear a Russian ballet. What kind of music do they expect to hear? Well, let’s listen to what they were expecting to hear. [music playing] So whose music is this? So that’s a radically new sound, a radically new approach to modern art, and indeed, once again, if you ask, generally, cultural historians to put their finger on the moment that constitutes the beginning of Modernism it would probably be this moment of the performance of The Rite of Spring. Okay. So that’s the way it goes. That’s all the violin — or the violist or violinist, all the strings do. Let’s do that one more time with our guest artist. We’re going to add percussion now. [music playing] Ah, what a virtuoso duo. [laughs] Okay. So that was — Jacob, don’t go away completely here. Professor Craig Wright: Down bows, everything down bow, and that’s counterintuitive to your normal string teaching. So we’ve taken these string instruments and instead of using them as these warm, vibrato-filled communicators we’re — in the string family we’re sort of turning them in now to percussion instruments. That’s a very percussive effect. So not only do we have new percussion instruments; we have percussive effects with the existing instruments. And perhaps most important here is the chord, the music that Stravinsky is setting forth here. It’s an odd chord. It’s an odd occurrence. What he’s got here is a perfectly innocuous E major triad. [plays piano] I’ll put it down here an octave. [plays piano] And then on top of it he’s got a seventh chord starting on E-flat. [plays piano] And either — each of those — each [plays piano] by itself is rather consonant, but you put the two of them together [plays piano]. So this is a good example of another way that Modernism in music is created, and that’s for the use of, very obviously, a polychord. Interesting point. I’m going to go to some slides now because it’s exactly at this time in the history of art that painters started doing this same kind of thing. So we’re going to go to the first slide here. Who painted this, please? Professor Craig Wright: Nice and loud. I hear it in the back. Professor Craig Wright: Picasso. Okay. “Three Musicians” by Pablo Picasso. And what we have here is sort of one musician kind of out of phase with himself — one musician and then another musician slightly in an irregular position against that. Next type of slide here: This is Georges Braque, “Woman with Violin,” a little bit difficult to see the woman there in the context of this highly fragmented violin. Now we’re going to go on to Juan Gris’ “Violin” and now we’re going to go on to a slide taken from a book published in 1916by Albert Gleizes. But we can see the point here. Off to the left we have just a square. And that square then is being rotated against itself. It’s being rotated itself — against itself in another position, rotated itself in yet another position, and that’s all these musicians are doing. They’re taking one triad and then taking the triad right next to each other so the triads are slightly out of phase with each other. And ultimately it produces a rather dissonant configuration. Okay. That’s all we need here by way of the slides. Well, the premiere of The Rite of Spring was just as dissonant as some of these paintings are. Indeed, it caused a scandal. It caused a riot. It created the most infamous — I guess — riot in the history of music, and we have, fortunately, and they are contained here in Modris Eksteins’s book among other places, some primary source accounts — people who were there at the time telling what it was like to be at this premiere. So here are a couple of direct quotes. “Then ensued a battery of screams countered by a foil of applause. We warred over art.” I like that: “warred over art.” “Or what some thought was art but others didn’t. About forty of the protesters were forced out of the theater by the police, but that did not quell the disturbance. The lights in the auditorium were turned fully on, but that did not still the disjointed ravings of a mob of angry men and women.” End quote. And here’s another direct quote. “I was sitting in a box in which I had rented one seat. Three ladies sat in front of me and a young man occupied the place behind me. He stood up during the course of the ballet to see more clearly. The intense excitement under which he was laboring, thanks to the potent force of the music, portrayed itself presently when he began to beat rhythmically with his fists on the top of my head.” [laughter] [laughs] End quote. Well, what is it, again, specifically in this music of Stravinsky that causes this kind of reaction? Let me list for you — let me enumerate five things here. One: heavy dissonance. We just heard some of that, [plays piano] that kind of sound, almost a cluster-type dissonance, heavy dissonance created by polychords in which we have triads and these triads are only a half step apart. The roots are only a half step apart. So one: heavy dissonance. Two: much greater reliance on percussion: tympani, glockenspiel, celesta, that sort of thing. Three: as we saw with Jacob, the use of stringed instruments as percussion instruments, so a new use of these traditional instruments, and even the piano, this banging on the piano. The percussion — the piano is technically a percussion instrument but it’s a particularly lyrical one. Well, it’s not so lyrically used here in the modern idiom. Number four: an increased use of woodwinds. The strings fall into the background. The woodwinds with their potentially bright, brittle sound are now foregrounded. And fifth: this idea of rhythm, driving rhythms, yes, but irregular rhythms and polymeters and irregular meters all creating this kind of disjunctive effect. Professor Craig Wright: It’s different? Student: Different than the Mozart, more fast paced. Professor Craig Wright: More fast paced, more sort of upbeat, kind of like a slap in the face. Who doesn’t like it? End — okay. Caroline, honest person out there. She doesn’t like it. At the end of the day, are you going to go home when it’s time to relax and put on this music? Probably not. So music here is just a kind of catalyst for the ballet and to really begin to appreciate something such as this, Stravinsky’s approach to Modernism, we’ve kind of — we do, in fact — have to see it to experience it fully. And that’s really what we’re going to do here next. We’re going to do that in section starting today. We have a wonderful video for you of the reconstruction of The Rite of Spring because the initial choreography, which is an important part of this, was lost. So a woman choreographer came along, Millicent Hodson, and she reconstructed all the choreography for this dance and then they filmed it so this is a wonderful opportunity to see this. We’ll be talking about this in section starting today. Okay. We’re finished with our brief introduction to Modernism and where do we stand now in our course? Well, obviously we’re pretty much at the end of it. What do you have to do — what remains for you to do? Zach, what do you got to do? Professor Craig Wright: You got to do your last paper. Each TA will assign that last paper. What else do you have to do? Student: Prepare for the final exam. Professor Craig Wright: Prepare for the final exam. We will be sending you a prep sheet. The final exam I believe is Wednesday, the seventeenth, at two p.m. and will be in this room. Other things? Professor Craig Wright: Yeah, the last six Listening Exercises, and I think that’s about it. And, of course, in addition there’s a review section that I and one or two of the TAs will be doing a week from today right back in here. So is that the end of today? No, that’s not the end of today. We have a good half hour left and I’d like to work just with one piece and one composer. At the end of the course, I like to do a piece that’s really — that I love. It doesn’t really teach you much of anything. It’s an odd sensation. Oftentimes there are really lovely pieces that I would like to incorporate in the textbook and in this program generally but I can’t do it because they don’t really teach us anything. We were listening to one in section, this intro music, the other day by Samuel Barber. Anybody know who wrote a famous piece — or what the name of that famous piece by Samuel Barber is? Thaddeus, Elizabeth, Raoul. Professor Craig Wright: “The Adagio of — for Strings” by Samuel Barber, American — it’s beautiful. We should — everybody should download it for ninety-nine cents. It’s just gorgeous, but we don’t really learn anything from it. Well, this is a piece that we — we’re about to hear that we will learn only really one thing about, and that is the idea of an orchestral Lied. So I’m going to go back to one of my favorite composers and that is Gustav Mahler. We talked a little bit about Gustav Mahler when we had our lecture on the symphony in the nineteenth century, and we said that Mahler was of Jewish descent, from what is now a portion of the Czech Republic, who came in to Vienna to study music. He started as a pianist, became a conductor, and basically he earned his living as a conductor. He got small-time jobs out in the provinces and then ultimately worked his way back to Vienna, where he became the conductor of the Staatsoper in Vienna, and if you ever go to Vienna — and you should all go to Vienna. It’s an incredibly musical city. Everywhere you go you see these silhouettes of Mozart. It is so cool. So you have to go to — you can’t walk a block without seeing Mozart. It’s to die for. So there we are on the Ringstrasse with the great Staatsoper, and this is where Gustav Mahler conducted and it’s still there, but Mahler was a difficult person to get along with. I suppose oftentimes great artists are, geniuses are. They tend to be self-referential and maybe rightly so, but in any event, he was an orchestral tyrant. His players didn’t like playing for them, and after ten years they didn’t renew his contract. In effect, he was fired in Vienna but, as good fortune had it, he was able — or at that time there was an opening in New York City so he comes to New York to conduct first the Metropolitan Opera and then a year or so later he took on what was to become the New York Philharmonic. So there he is, the principal conductor, now in New York City. Interestingly enough, on two occasions Mahler came to New Haven. He came to New Haven. He brought — first was in 1910, he brought the New York Philharmonic to New Haven and where did they perform? Where would you imagine they’d perform? Woolsey Hall. Okay? Woolsey Hall. Woolsey Hall was built for Gustav Mahler. No. That’s not really true, but it gets across a point: that Woolsey Hall was built to be a concert hall for what Gustav Mahler represented, which was the apotheosis, the ultimate flourishing, although they didn’t know it was the ultimate at the time, of this great instrument, which was the nineteenth-century orchestra. So Mahler brings the New York Philharmonic to Woolsey Hall. The next time you’re in Woolsey Hall, think of Gustav Mahler standing on those boards there. And, as good luck would have it again, the concert was reviewed in of all places, as you can see by the handout for today, The Yale Daily. Okay? How about that? The Yale Daily [laughs] reviews Gustav Mahler, astonishing. Okay, astonishing. And I didn’t — darn it — I didn’t bring my glasses today, but you can sort of look at the review there and it talks about the repertoire. What did he perform? First of all, they slightly misspelled his name. There’s no “e” on Gustav in the way he spelled it, but that doesn’t really matter. What did they perform at this concert conducted by Mahler in Woolsey Hall? What’s it say there? Elizabeth. Professor Craig Wright: Okay, Symphonie fantastique, the basis of what? Your Listening Exercise 34. Okay? So that was one of the big pieces, the ones that you have just engaged. What else, please? Professor Craig Wright: Okay. Bach orchestral suite. It doesn’t say which one. It doesn’t matter. What else? Professor Craig Wright: Yeah. That’s good. Till Eulenspiegel’s Merry Pranks. That’s another one of these tone poems, like Zarathusta, and like Death and Transfiguration, by Strauss, and there was also a pianist there, and what did she perform, Olga Samaroff? Professor Craig Wright: Yeah, the Grieg Piano Concerto. But no music by Mahler, because in his day Mahler was thought to really be more of a conductor than he was a composer. We’ll come back to that point in a minute. The second time that Mahler came to New Haven was the next year, 1911. He went to what was then called New Haven Hospital. Why? Because he had a heart condition. And I gather — and we have in our midst today a specialist who can talk to this more directly than I — a streptococcal infection, a lingering streptococcal infection in the area of the heart that had greatly weakened his heart so the doctors at Yale-New Haven Hospital — New Haven Hospital said, “There’s really nothing we can do for you.” He goes back to New York, goes immediately back to Vienna and he dies within six weeks of this heart condition. And we have — and I’m delighted to say Dr. James Hines has been with us all semester. Jim, thank you for your attendance — a cardiologist. He has been here. You may have thought that this was just accidental, but in case — I was thinking this morning. We’ve never told you that we had — if your heart begins to palpitate when you’re listening to all this really great music and you become aphasic or something like that, we have an attendant here ready to serve you in the form of Dr. Hines. So you’ve been in good hands all along and thank you, Jim, for being here. So let’s take a look at some of the things that Gustav Mahler composed here, and I think we’ve got a list up on the board. Okay. Symphonies: nine symphonies. Why is it that everybody composes nine symphonies and then they die — [laughs] — stop at eight. No. He composed also nine symphonies. He composed nine symphonies and if you like Mahler, and I hope you will come to like Mahler, I think there’s an entry path into these symphonies. Start with number four. It’s the most user friendly, then number one. We played two tracks out of number one in that symphony lecture so you know that it’s a great piece too. Then Symphony number five, which is worth the price of admission, really, if for no other reason than the middle movement there. That Adagietto is just so heartbreakingly beautiful that no one would want to miss it, and then ultimately a little bit more challenging symphonies, bigger symphonies: number eight and number nine. Mahler also wrote, as you can see up there, two collections of songs. They’re called orchestral Lieder. We have this orchestral Lied. It simply means orchestral song. We’ve had the Lied before in our course. Where? Indeed, what was the name of the Lied that we worked with? Composer’s name, the name of the piece? Hm? Professor Craig Wright: Okay. That’s it. What was the name of the piece? Professor Craig Wright: “The Elf King.” Thank you, Frederick. And who was the composer? Professor Craig Wright: Franz Schubert. Okay. So we’ve had a — that’s a Lied for piano but now we have a Lied for voice and orchestra, so it tends to be bigger and more flamboyant. This is a new genre. It’s longer, it’s more colorful, yet it features a single voice singing a single text. So we’re going to focus on — now — on one of Gustav Mahler’s orchestral Lieds, and it’s talked about in the textbook there right before Impressionism. No Listening Exercise on it and, as I say, it’s in there just because I think it’s a drop-dead beautiful piece and I want to try to proselytize a bit with regard to Mahler’s music so it has a text. Here’s the text. The text is by romantic German poet Friedrich Ruckert. We’re now talking about “Ich bin der Welt abhanden gekommen” by Friedrich Ruckert as set in this collection of five songs about 1902. And let’s take a look at the German here just for a moment, “Ich bin der Welt abhanden gekommen,” “I’ve become detached from the world.” And I thought it’d be nice to hear a German speaker, or somebody that speaks pretty good German, tackle this text so I’ve asked a student, David Narotsky to stand up, if you would. David’s applying to med school. Right? You’re going around for all kinds of med school interviews but here he’s putting on his German hat for us this morning. So read the first strophe, please, David. Professor Craig Wright: Okay. Let’s cut to the last one and a little bit more slowly and a little — because it slows down. So let’s read it a little more slowly. Professor Craig Wright: Okay. Great. Thanks very much. So, as you can see here, this is, in a sense, old person’s music in that this is an individual that has become disenchanted — is exhausted from the trials and tribulations of this world. There’s that sense of “Ich bin der Welt abhanden gekommen,” I’ve become detached from the world and if you don’t see much of me anymore I don’t really care because, as it says in the last strophe, “Ich bin gestorben dem Weltgetümmel,” I’m dead to the tumult I guess of the world, “und ruh’ in einem stillen Gebiet,” and I rest now in a still land, “ich leb’ allein,” I’m living alone in my heaven,” “in meinem Lieben, in meinem Lied,” and there it’s an interesting play of the word Lied because it’s not so much a song. This is a metaphor for all of his music so this is an individual that has become detached from the world and simply wants to live in the world of music. So let’s listen to a bit of it now. And it starts out with an English horn. Somebody tell us, review for us, what an English horn is — talked about this before. Jerry. Professor Craig Wright: A lower oboe. That’s right, a lower oboe, and it sounds a little bit mournful, sounds a little bit nostalgic here, so we hear a lovely harp underneath and then the English horn will start with just one phrase and then that phrase will grow. It’s kind of a cell or a motive growing into a longer melody as we discussed in the beginning of the course. Okay. Now we’re going to pause it here because there’s one other small point that I want to make and that has to do with a — what’s called a suspension. A suspension is something that composers set up in music to sort of make us feel a particular way, and they’ll start with this by having a note be consonant [plays piano] and then having — moving the harmony underneath of it [plays piano] to a dissonance [thereby suspending the upper note as a dissonance] and then [plays piano] resolving it to a consonant like that or maybe [plays piano]. And the longer they sit on the dissonance, the more feeling, I think, is communicated. And here at the end of the Romantic period it tends to be — they tend to sit on these dissonances inside of the suspension for a long period of time. So we’re about to hear — We’re about to hear the strings go up and play a suspension and then the English horn will do the same. There it is [music playing]. Now the English horn will suspend, [music playing] dissonance [music playing]. Okay. So that’s the piece. Now we’re going to do something we’ve only done on one other occasion in the class and that is to listen to the whole piece from beginning to end. I’d like to do this and it may be a little hokey I guess, but it doesn’t matter. I’m going to turn off all the lights here as best I can, and I do this because it gives you a sense, sometimes, of what — at least how I engage music oftentimes — what does it do for us? Okay. So that’s our last piece of music for Listening to Music here. Now I’m going to tell you what this class was really about. [laughs] It wasn’t about listening to music. It was about saving classical music. Why? Why would we want to save classical music? We could spend hours discussing that. We would want to save it, arguably, because it is one of the things that we value in Western culture. What do we value? I was thinking about this, this morning. We’ve got — we just had a big election. Right? We value democracy. We value religious freedom. We value equality of the sexes, of gender. What else? Due process under the law. We value Shakespeare. We value Leonardo da Vinci and the symphonies of Mozart for example, and these are very important things and I think they’re worth fighting for and worth trying to preserve. Recently, somebody gave the School of Music how much money? One hundred million dollars to keep classical music alive. That’s a lot of money. I’ve done my part, showed up here every day, haven’t missed a minute. Now it’s time for you to do your part. What’s your part? You have to do the following kinds of things. You have to continue to buy CDs and download classical music off of iTunes or whatever it is. Don’t steal that stuff. Why? If you take that stuff for nothing, what are you doing? You’re taking the livelihood away from Jacob and Santana and Lynda here, just the livelihood of musicians. They’ve put their labor into it and you’re taking it for nothing. So download these things. It doesn’t cost all that much. Two: get involved. Get involved in informal singing groups, keep your piano lessons, if you’ve ever had those kinds of things going on, local choral groups, whatever. You get out of Yale. What do you do? Get on the boards of these artistic institutions, your local symphony, your local choral society, opera company, Neighborhood Music School here. Get on the board of that and help them, those sorts of folks. Most important, give music lessons to your children, adopted or natural. Why? Teaches them hard work, teaches them to think sequentially, teaches them various forms of quantitative reasoning, teaches them also to be disciplined and teaches them to have a pride in the work product that they ultimately generate. So these are the kinds of things that you can do.